Omnis Network Review 2019: Is Omnis Network a Good Hosting? Established in 1999, Omnis Network is a veteran in the hosting business. They’ve got all-inclusive web hosting plans great for beginners, but be aware that these come at a higher cost. Omnis Network is an American web hosting provider headquartered in Tempe, Arizona. Founded in 1999, this company has served over 400,000 domains and web hosting accounts and has had a perfect BBB rating since their inception. Though they only have a single data center located in their hometown, they serve customers distributed across the globe, including in countries such as Panama, Azerbaijan, Sierra Leone, and Egypt. From the very beginning, the objective of Omnis Network was to provide affordable, enterprise-level web hosting services for individuals and businesses of all sizes. This all looks pretty good on the surface, but there are definitely limitations. For instance, the free website builder only allows you to create three webpages maximum — probably the stingiest allowance I’ve ever seen. Their free domain name registration is also only applicable for top-level domains under a certain price range. Another big problem with Omnis Network is the number of complaints from customers who have subscribed to their unlimited hosting plans. What they quickly find out is that the more they use this unlimited service, the more the vendor restricts their bandwidth. Omnis Network doesn’t do enough to make their plans transparent and therefore easy to use. Instead of informing their customers that their unlimited quota is almost depleted, they just make the feature unavailable. This can have a devastating effect on a business website. Additionally, their database server goes down quite regularly. Omnis Network’s hosting plans are quite expensive compared to offerings from leading competitors. Though annual and biennial payments can cut the subscription costs significantly, their prices are still higher than other major brands in the industry. In addition, you can find some of the features that Omnis Network only includes in premium plans being offered for free by other vendors. Furthermore, while Omnis Network offers a 99.9% uptime guarantee, they don’t commit to compensating their customers in the event that they don’t live up to this promise. This is significant downside given that uptime guarantees have become an industry standard. What’s more, Omnis Network doesn’t readily display their server uptimes, making it hard for customers to successfully file complaints. On the bright side, they do offer a 30-day money back guarantee, so you can try them out and get a refund if you find they’re not a great fit for you. Their technical support team is available 24/7 via telephone, email, and live chat. If you’re an existing customer, it’s best to contact them through the ticket system in your client portal. Unfortunately, while their support team is helpful, it’s not uncommon to be connected with a rude, unfriendly representative, sometimes making you feel like you interrupted them on a more important task. Their knowledge base also has very little information, which isn’t good news for the DIY enthusiast. Though they’re one of the veterans of the industry, Omnis Network hasn’t done well in being transparent and honest with their customers. Furthermore, their customer support can be condescending and rude, which leaves one reconsidering this vendor as a long-term web hosting partner. 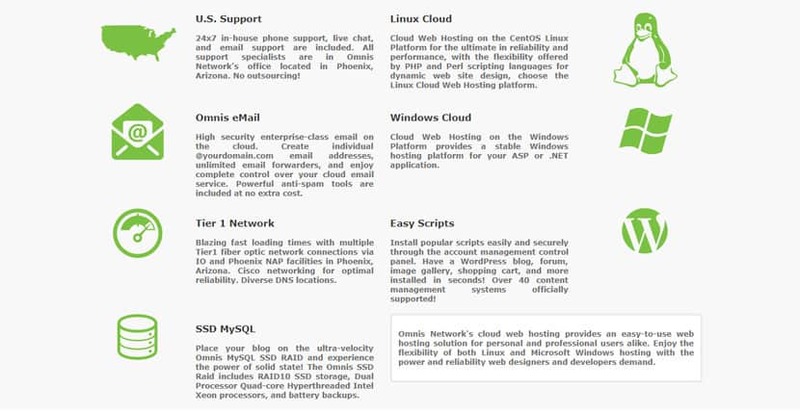 Wondering how Omnis Network stacks up against other Web Hosting companies? Enter any other Web Hosting company and we will give you a side-by-side comparison.